Best surfer out there is the one having the most fun. What do you want to get out of surfing? True or false? And who is the best surfer after all? It all depends on what you want to get out of surfing. If you want to have fun and enjoy yourself, if you see surfing as a past time or hobby, then definitely having fun is the most important thing. Some would argue though that the more you know how to surf, the more fun you will have in the lineup. We cannot beat this argument. 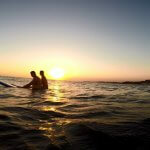 It is true the more experienced surfers, do catch the most waves and do have a lot of fun. But something we tend to forget about the good surfers is that they take the joy of surfing for granted. Can this beat the joy of catching your first green wave? I personally don’t remember every single day I surfed. However, I do remember catching this first green wave. And since the majority of us will not take on surfing professionally, why not just try to enjoy ourselves and have fun surfing? And stop stressing or being in a bad mood if it’s just a bad surf day. Because after all, just jumping in the water and making it to the lineup is enough to make it a good surf day. When I go to Europe to visit my home country and haven’t surfed for weeks or even months, this first surfing session after I am back is always magical. No matter how many waves I catch, or how windy or glassy the waves are, I am just happy to be in the water. After, of course, a week or two, when I get used to it, I tend to take surfing for granted. I then start getting grumpy if I am on a bad surf day or waves are not as good. Is this a good surf day or what?! This is human nature, we take things for granted and tend not to appreciate them. But let’s try to enjoy every single surf session – good or bad. Let’s try to just be happy that instead of spending a day at the office, we are lucky enough to make it to the lineup.